Big Dog Mom’s Raw Feeding Debut! It’s official. Big Dog Mom has officially hit the BIG TIME! As you might have guessed, I am re-defining the phrase BIG TIME of course. In the dog world, to be recognized by an expert and thought leader in animal nutrition and raw feeding is absolutely considered BIG TIME and I couldn’t be more excited to share this with you. 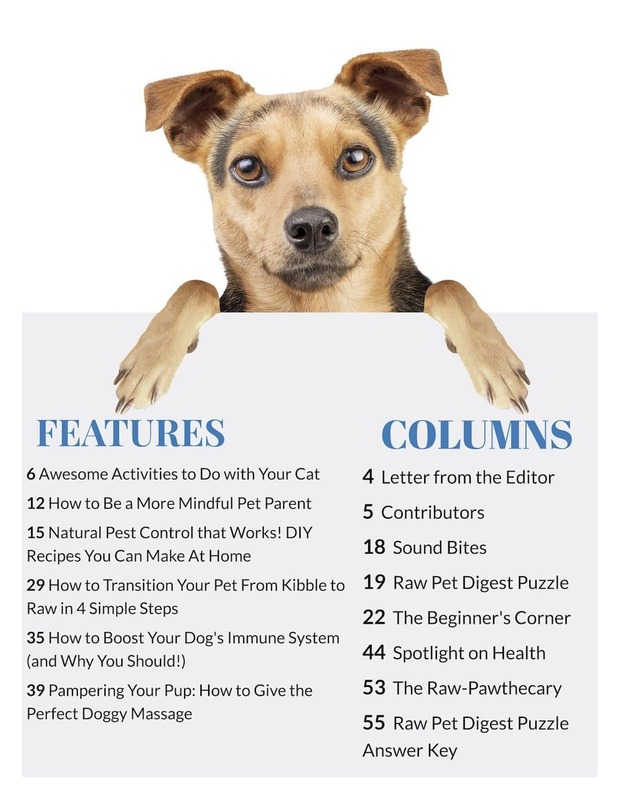 Owner and Editor-in-Chief, Kristin Clark, certified by the American Council of Animal Naturopathy as a Carnivore Nutrition Consultant and a Small Animal Naturopath, asked to interview me for her latest issue of Raw Pet Digest . Little ol’ me, Big Dog Mom. You know, the Jackie of some trades but a master of none. I was humbled and honored to oblige. Raw Pet Digest is a pet-centered, information packed online magazine devoted to raw feeding and holistic, natural health care for dogs and cats. 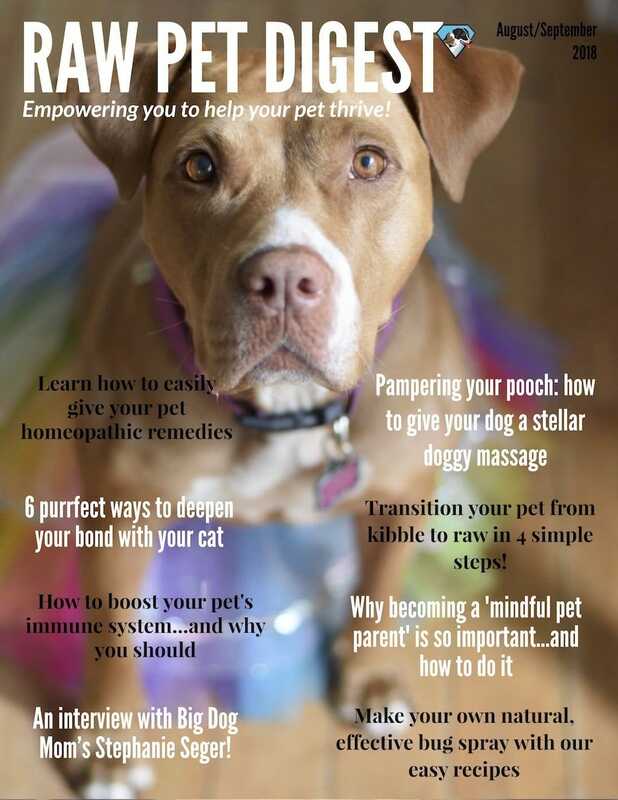 I am reprinting our interview unedited as it appears in the August-September 2018 issue of Raw Pet Digest . At the end of the interview I have for you all of the links and resources mentioned in this post, so be sure to check below for further information. I would love to hear your feedback about this interview. Any and all comments are welcome below! And, as always, pease feel free to share this with your friends who are interested in holistic, natural health care for their dogs. At only $3.33 per issue, Raw Pet Digest magazine is an unbelievable value for all pet parents whether you raw feed or not. This post contains affiliate links from which I may receive a small compensation. There is NO ADDED COST to you should you use these links. I thank you very much for your support! Editor’s note: Here at Raw Pet Digest , we’re always looking for people and companies that are devoted to helping your dog and/ or cat be as healthy as possible. In this issue, we’re spotlighting Stephanie Seger of BigDogMom.com. Stephanie’s excellent blog is geared towards large and giant-breed dogs, but we think there’s something there for all dog parents. Visit BigDogMom.com to check it out! Thank you to Stephanie Seger for answering our questions! 1. I know you’ve been around big dogs all your life. Growing up, were your dogs raw fed? If not, what made you first start exploring raw feeding? It wasn’t until my second mastiff, Linus, that I started to explore raw feeding. In addition to other issues, he was basically anorexic. I went through every brand of kibble with him to no avail. Raw feeding was my last resort with him and it worked better than anything else I had tried. It wasn’t until I got Sulley as a puppy that I made the switch to fully becoming a prey model raw feeder. 2. Cost is one of the biggest prohibitors for people considering raw feeding. Is it possible to affordably feed giant breed dogs (like your Mastiffs) raw? Would you mind sharing your top two tips about how to do it? It is absolutely possible to feed large and giant breed dogs a raw diet without going broke. My biggest recommendation is to find a good local raw co-op and explore local meat markets and grocery stores for leftovers or meats they can’t sell. Between both of these you can generally get everything you will need to put together a balanced diet for your big dogs. And while this is not a tip, per se, I do also encourage people to consider the value they are getting with the food they are feeding. It may be true that most brands of kibble (not all) are cheaper to feed than raw, but how much of that kibble is actually being processed in your dog’s body for the benefit of the dog’s health? The poop volume difference alone answers this question. To me, that is waste: waste literally, and waste financially. 3. In your opinion, how does a raw diet aid both longevity and overall health? At a very fundamental level, dogs were meant to eat meat. Everything about them screams carnivore. It is unnatural to expect a carnivore to eat nothing but a bowl full of baked, dry wafers and maintain good health. That would be like me eating nothing but Fritos. Sure I love them and could easily get addicted to their salty goodness, but most reasonable people would say my eventual diabetes, high blood pressure and rolls of fat were due to my poor diet. So, that was a long-winded way of saying I believe a raw diet is the only natural diet for my canine carnivore family members. Longevity starts with disease prevention. Limiting my Frito intake (or my dog?s intake of kibble), is one huge step toward disease prevention. Lastly, I will say the proof is in the pudding. One look at my dogs’ coats, skin, teeth, ears, muscle tone, and appetite and you will see the picture of great health. 4. There are lots of raw diet philosophies out there (commercially prepared raw, prey model raw, a mix of raw foods that are cut up for the animal, etc.). Have you found one type that you prefer? If so, which one? Does it ever depend on the dog (size, breed, activity level)? I feed a whole raw prey model diet. For me, this means that I buy in bulk whole raw meat, bone and organ and then build meals and create balance over time myself. I really like feeding whole raw. My boys love the variety it offers between the meat, organ, and raw meaty bones. I do give veggies and fruits as treats mostly and for a prebiotic source, but I don’t factor them into the diet itself. I have given some commercial raw as a supplement and treat for my boys, but the cost is generally prohibitive for most big dog owners. Most types of raw feeding can work for any breed of dog. What is more of an issue based on breed size would be the bone in pieces you are selecting. For example, a chicken neck would be perfect for a tiny maltese, but would pose a choking hazard for a Mastiff. Because I am planning out and managing every aspect of my dogs’ diet, I can make safe choices that are best for my big boys. 5. For those people who may not know about your blog, can you tell me a bit about it? What’s the main goal? How long have you been blogging? What’s been the single biggest revelation you’ve had about dogs and dog nutrition since you started the blog? Thank you so much for asking! BigDogMom.com launched on May 8, 2017 so I have been blogging just a little over a year now. Big Dog Mom is a content-rich blog and brand that is dedicated to large and giant breed dogs by informing and empowering the people who love them. My tagline is “Knowledge, without all the fluff.” This is a play on words of course, but with the larger meaning being that Big Dog Mom isn’t going to be a place where I chat about fluffy topics. I try to focus on substance: information that big dog owners can take and use that will benefit them and their big dogs. My single biggest revelation? Humm, that’s a tough one. When I first started, I actually thought people would flock to my site the second I clicked publish on a post. The reality is blogging is a long-term venture and slow and steady marathon. While my goals have always been mission-based and future-focused, the day-to-day of blogging and the ups and downs of traffic have been the biggest revelation for me. I feel like as long as dog owners are getting value from the content I am putting out, the analytics are far down on my list of priorities. 6. What is your favorite thing about Mastiffs as a breed? Oh gosh, where do I start?! There are so many things that I love, including the drool if you can believe that. Mastiffs are enormous dogs who have no idea how big they are. I guess I love that contradiction the most. The dichotomy between the big-hearted softies that I know and the imposition that the world around us sees. I have written several posts on BigDogMom.com about the Mastiff breed if anyone wants to learn more about them. 7. What do you find is the most common fear people have about raw feeding? What do you say in response to that fear? I did a survey not that long ago asking this very question. For those people who choose not to feed raw, why have they made that choice? The responses fell into three buckets: concern about bacteria, cost, and time/inconvenience. Only one of these is an actual fear, and one that I believe is perpetuated by kibble manufacturers. The concern about bacteria, whether it is people getting sick from preparing raw meat for their dog, or the dog getting sick, is one that is just not logical. I address this in two ways. I have several blog posts on BigDogMom.com in which I lay out the facts as they relate to bacteria. To put it simply, dogs are able to handle any and all bacteria in their food, and as long as we are using good sanitation practices, we can be safe preparing it for them. I also created the Raw Feeders Guide to Preventing Cross Contamination, which can be found on BigDogMom.com. It is a simple resource guide specifically for those whose primary concern about raw is the risk from bacteria. I went to graduate school for microbiology and toxicology, so I feel like I have some knowledge and expertise that can help mitigate this concern for people. 8. What are the reasons, do you think, that most people choose to start raw feeding? Most people I know are drawn to raw feeding when their dog is not thriving on kibble for one reason or another. The people who believe their dogs are in perfect health on a kibble diet generally see no reason to change. It is the people whose dogs have allergies, gut issues, or any number of other ailments pop up who seek solutions in a raw, natural diet. 9. What do you say to someone who is nervous to make the switch from feeding kibble to feeding raw? You can always go back. Consider raw feeding as an experiment, a trial if you will. Don’t feel like this is a permanent decision that can never be changed. There is a reason that most people never go back to kibble. It is taking that first step that is the hardest for most. And, while I switched completely all at once with my dog, I am completely comfortable recommending people do a half and half transition if they are worried. I have recommended to people who are kibble feeders to just give one bone-in piece of raw meat and see what happens. Once they see their dog has the ability and shows pure joy in crunching those bones, the fear starts to subside. 10. Can you describe a typical day in your dogs’ diet? What do you feed them? What sort of variety do they get? Sure. The variety for my boys in the types of meat they get is based on what I order monthly. So one month they may get some pork and the next month they don’t get any. So, this month they are getting: Beef clod meat, turkey necks, beef heart, green tripe, duck necks, organ grind (liver, kidney, thymus), lamb grind, rabbit grind, wild (deer, elk) grind, whole sardines, raw egg, and a mix of the following supplements: probiotics, enzymes, Nupro, krill oil, kefir, and coconut oil. I recently got some GLM [Green Lipped Mussels] that I am going to start Junior on for his pain. I think that’s all, although I’m sure I forgot something. 11. What are your thoughts about fasting? Do you fast your own dogs? I wholeheartedly believe in the power and value of fasting and I have started to fast Junior and Sulley one day a week on Sundays. When Junior turns 2, I plan to work both dogs up to only getting one meal a day and maybe adding one more fast day throughout the week. I won’t make any changes other than the Sunday fast until Junior turns two. 12. Do you have any tips for people that are getting into raw feeding, either about choosing a good commercial raw or choosing meat suppliers if they’re doing PMR or whole prey? We are lucky now because there are so many resources out there for beginners. My best advice is to just start. You are never going to know all there is to know about raw feeding. When I first started out I took advantage of my good friend Google and found a couple local raw co-ops. I reached out to both and asked general questions to get a feel for them, checked their prices, and started my list of what I would need and where I was going to buy it from. People want this stuff handed to them, but it really isn’t complicated. When I reached out to the two local co-ops here, one lady was super knowledgeable and helpful and the other not at all. Guess who I consider my raw feeding mentor today? You guessed it. All it took was me reaching out to her. As far as commercial raw, I recommend Darwin’s Natural Pet Products or Raw Paws Pet Food, but there are others that I would absolutely buy from if I lived closer, such as Vibrant K9 (www.vibrantk9.com). 13. How important is it to you for your dog’s meat (including bones and organs) to be organic/hormone-free/antibiotic-free/ pasture-raised? To be completely honest, my diet isn’t that clean, so my standard for my dogs is about the same. I believe almost everything I feed them is hormone and antibiotic-free, but I don’t make feeding organic a top priority. Perhaps if I had tiny dogs and cost was not an issue, I could make that a priority. For me, the co-op that I buy from gets everything from local farmers. I buy what she can get. I don’t really have the luxury of picking and choosing if what she gets isn’t organic. I hope that makes sense. 14. Do you have any sort of supplements that you really like or use? Which ones? Why? And why are they important if the dog is getting a raw fed diet? The only real supplement that I believe is absolutely necessary is a probiotic, but I am someone that does more than I’m sure I need to. The #1 TRUSTED PROBIOTICS FOR PETS: Made in the USA, with years of consistent, Natural results combatting dog diarrhea, loose stool, yeast overgrowth, bad breath, constipation, itching & scratching, allergies, digestive issues, and gut related problems in pets. Wholistic choice to bring your pet relief. VET RECOMMENDED - NO RICE, NO MALTODEXTRIN, Gluten-Free, Non-GMO, Non Dairy, No Soy, No Fillers, No Flavorings, Odorless, NO BYPRODUCTS. FEEL CONFIDENT: 100% Money Back Guarantee within 60 days of purchase. Best if used within 8-10 months after purchase. BACKED BY SCIENCE: Formulated specifically for the dietary and health needs of your dog or cat. Scientifically researched for pets and recommended by Top Breeders and Veterinarians as a #1 trusted brand in America. I outlined above some of the supplements I give. My general belief is that if you are feeding a whole raw diet with the proper balance of meat, bone, and organ, and you’re feeding a variety of proteins (not including chicken), supplementation should not be necessary. 15. What are your thoughts on vaccinating? What do you say to people who ask you about vaccinating their dogs? Oh boy, this is a hot topic. I believe in disease prevention. Period. I believe in vaccination both for my dogs and my children. That said, I do not vaccinate for things that are not endemic in my area. For example, I would have no need to vaccinate against Lyme disease since my boys aren’t at high risk here in Arizona. I will also be transparent in saying that I never had an issue with vaccinating my dogs until Junior. I don’t know if it’s him or the vaccines, but he has reacted twice, the latter of which was a lump serious enough for me to question any further vaccines for him. I do recommend vaccines, especially for puppies. As dogs age, I am more apt to recommend titers. And for dogs like Junior, I will be doing my research to find out what the best course of action is in the future. It was such an honor to interview you! I’ve learned a lot about big dogs from you, and I LOVE your blog! Plus, you have two of the most gorgeous boys around–their faces make my heart melt! Thank you for all you do to help big dogs and big dog parents, Stephanie! You are an inspiration to me!